At least that’s the conclusion that Dan and I came up with when we saw a spike in the organic traffic to our programming help forums. A flood of search queries for turing tutorials, turing help, and more specific game project concepts such as collision detection have left a visible impact on the traffic. 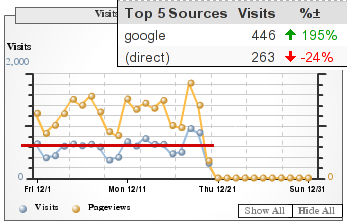 Comparing against the same day, last week, incoming Google numbers have nearly doubled. Though I think the trends will get back to regular levels after Friday, when the holidays starts, and school ends for the year. For those in the panic mode over the fast approaching deadlines, lets review how you can optimize your time and finish that programming ISU on time. Run through the Turing Walkthrough, and review all the basics. When asking questions, make sure to have a descriptive title. “Please HELP” and such generics tend to be ignored. Don’t panic! Many classic projects can be written in under 20 lines, but make sure you know what you are doing – you will be asked. My final project is due a week after the holiday. I must also point out that I’m predicting it will be ready to play this Friday.